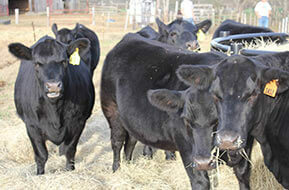 Adams Angus Farm began with the purchase of three heifers by Sidney F. Adams in 1939. He kept one heifer for himself and gave each of his two sons Robert (Bob) Adams and Gordon Adams one heifer each. The herd grew slowly over the years but there was always a focus on quality and performance. 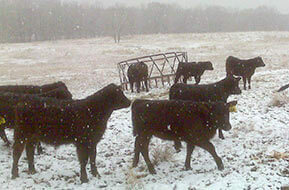 Performance record keeping began in the early 1960’s as Adams Angus Farm was a charter member of the Beef Cattle Improvement Association (BCIA). Through this and performance bull tests run at Auburn University great strides were made in selecting the truly most productive and efficient cattle. As time went on recording keeping was turned over to AHIR which is done the American Angus Association. 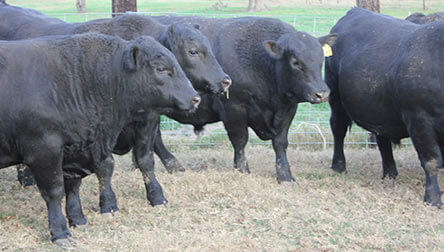 Many herd sires were purchased over the years as we worked to improve the herd with many of the best cattle coming from Burch Angus Ranch in Oklahoma in the 1960’s and 1970’s which were primarily Wye bred cattle. 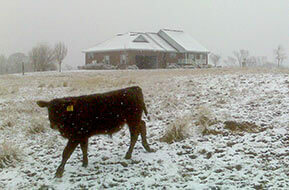 We also went to Gardiner Angus Ranch in 1995 and purchased GAR Predominance 3203. He was a “6807” son out of the Scotch Cap 199 cow and his impact is still felt here in our cow herd. In 1982 we began using artificial insemination (A.I.) which allowed us to breed to some of the absolute top bulls in the breed and now today some 30 years later at least 75% of the herd is bred A.I. each year. We also keep back our top yearling bull each year to use in our on herd. We like to see what kind of progeny we are producing first hand. Today our focus is more on the production of quality bulls than ever before as we see a greater and greater need to provide commercial cattleman with the consistency, integrity, and honesty they deserve year after year. We stand behind our cattle and guarantee them 100%. We can provide you with more data on these cattle than you probably want but we want you to know we take this business seriously and we know your livelihood often depends on us providing you with the data you can count on and use without hesitation.